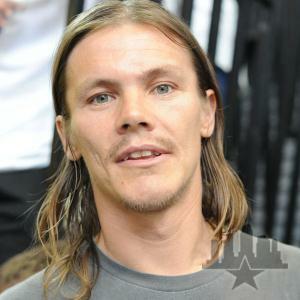 BIO: Geoffrey Rowley born June 6, 1976, in Liverpool, England is a professional skateboarder. Rowley began skating at the age of 13, and was first sponsored by Flip Skateboards when it was based in the United Kingdom under the name Deathbox before the move to California and is an original team member. He currently resides in Huntington Beach. ACCOMPLISHMENTS: Rowley appeared in the Tony Hawk video game franchise running from Tony Hawks Pro Skater to Tony Hawks Underground. He also made appearances on the MTV show Viva La Bam, and on the Liverpool band Short Sharp Shocks debut LP, providing backing vocals. Thrasher magazine voted Rowley Skater of year for 2000. He is one of the very few people to have a trick named after him, which is called the Rowley Darkslide.